WHAT ARE IDENTITY THEFT & STORE CREDIT CARD FRAUD? Identity theft and store credit card fraud are serious crimes that can have a devastating impact on their victims. Identity theft is the unauthorized use of your name and other personal information for criminal purposes. Store credit card fraud is the unauthorized use of your store credit card (or just your store credit card information) to make purchases either online or in person. But if you're armed with some basic information, and you take a few simple steps to protect yourself, chances are won't fall prey to these growing problems. Criminals use many different methods to obtain your personal info, from stealing your mail to going through your trash to looking over your shoulder at the ATM. Some con artists make false telephone solicitations to get you to reveal personal financial information. And you’d be amazed (and horrified) by the amount of information available about you online, via social media and through more covert hacking methods. Minor annoyance or major headaches? If someone steals your store credit card info and goes on a shopping spree, luckily, you’re not liable for the charges with most store credit cards. You’ll just need to cancel your existing card and get a new one. Annoying, but not devastating. However, identity theft can lead to serious, ongoing problems if someone uses your name, social security number and personal information to rack up thousands of dollars in unpaid bills—or commit a more serious crime. You could end up with a bad credit score. Correcting your credit report can take years. The best plan is to prevent it before it happens. 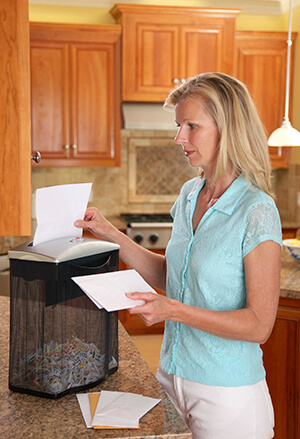 Shred your bills and other personal/financial paperwork before you toss them in the trash. Make sure your mailbox has a secure lock. Be cautious when using the ATM or signing a credit slip. If someone seems suspicious or is trying to peer over your shoulder, walk away and do your transaction later. Check your store credit card statement every month for strange charges. Beware of anyone who calls or emails you asking for personal financial information. If you lose a store credit card or your driver’s license, report it immediately. Make sure your online passwords are strong and cannot be easily found or guessed.